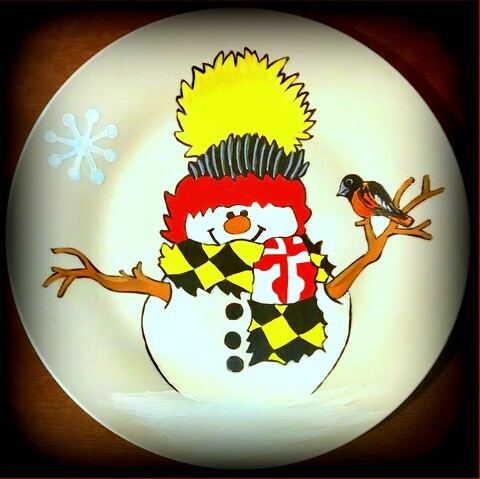 Paint a cute snowman on a 10 1/2″ plate. 2 designs available Paint is permanent and will not flake off. If you want your own wording, you can create it online. The space to fill is 2″ to 2 1/2″ x 7″. Print it out and we will show you how to transfer it so it can be painted onto your the plate. No artistic talent needed. The designs are easily transferable to the plate. A glass of wine or domestic beer is included in the ticket price for everyone over the age of 21. Plan to make a night of it. the Bushmill Tavern has fantastic food.